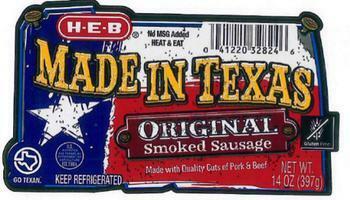 J Bar B Foods of Weimar, Texas, is recalling approximately 51,188 pounds of ready-to-eat cheddar smoked sausage. 14-oz. vacuum-sealed packages of “H-E-B MADE IN TEXAS ORIGINAL Smoked Sausage” with a sell by date of 5/19/19 and lot code LN2 90149. The recalled product, bearing establishment number “7066A” inside the USDA mark of inspection, was shipped to retail locations in Texas. Consumers with questions about the recall may contact Bonnie Hymen at (830) 788-7511, ext. 271.